Less than 3% of the turquoise available on the market today is totally natural. 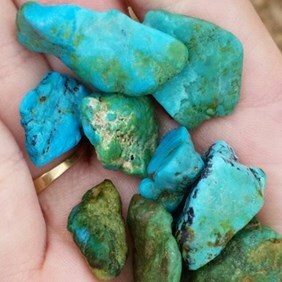 Due to the decrease of natural turquoise being found in mines across the world it is very rare to see totally natural and 100% untreated turquoise available to buy in beads or cabochons for jewellery making. Many people are unaware of this and unfortunately there are many suppliers who state that their turquoise is completely natural when in fact it has been stabilised or has had some treatment to enhance the colour. 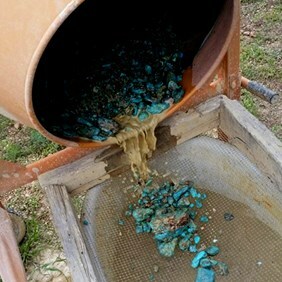 It is fairly standard across the industry that most turquoise has some sort of treatment. 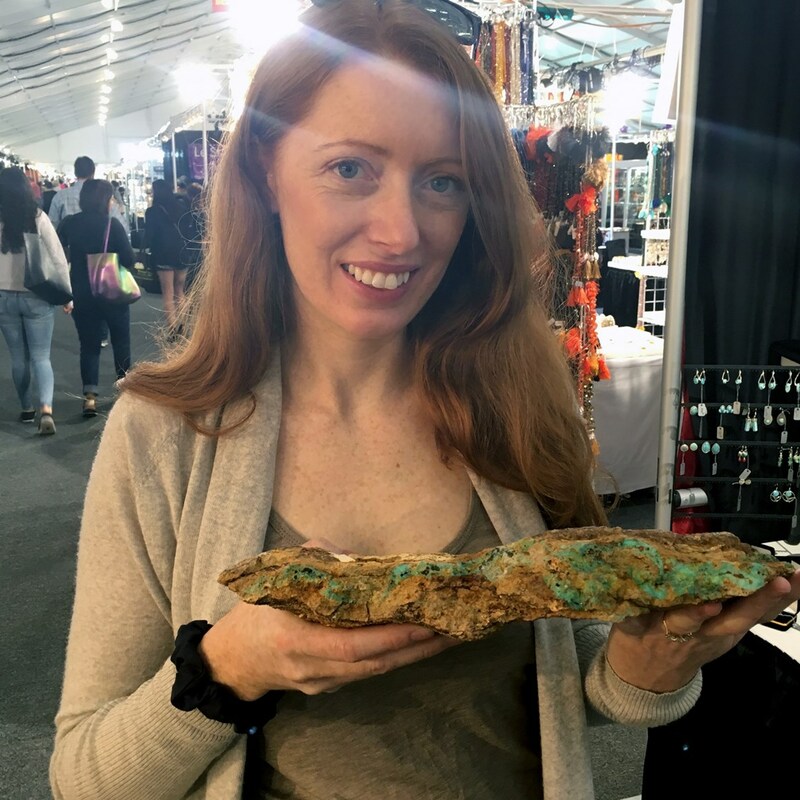 So, when our buyers at Kernowcraft discovered a new supplier of 100% natural and untreated turquoise we were really excited! What made this discovery even more unique is that we were able to meet and buy the natural gemstones directly from the husband and wife who mine and cut the stones themselves. 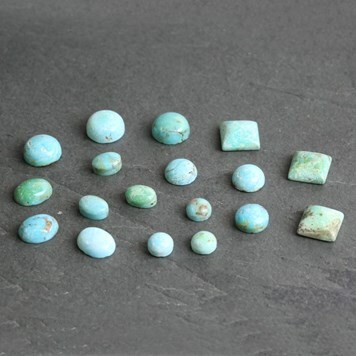 Click here to view 100% natural untreated turquoise cabochons from Kernowcraft. 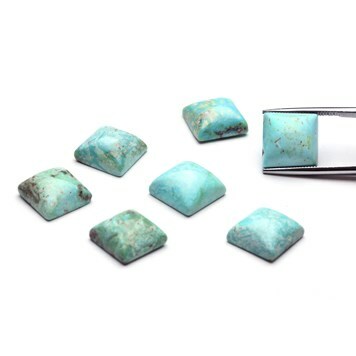 Click here to buy 100% natural & untreated turquoise cabochons. At Kernowcraft we like to meet and build long lasting relationships with our suppliers. As a company passed down through three generations, we have been working with many of our suppliers for around 20 or 30 years! 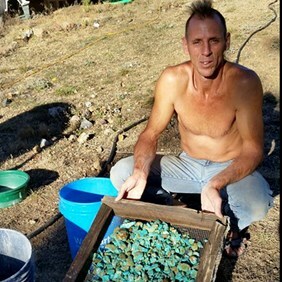 When we discovered this supply of 100% natural turquoise we were lucky enough to meet and get to know the miner and his wife who both mine, cut and polish the stones themselves. As a small family business ourselves, it is great to know that through building a relationship with specific suppliers we are helping to support small niche business like ourselves. 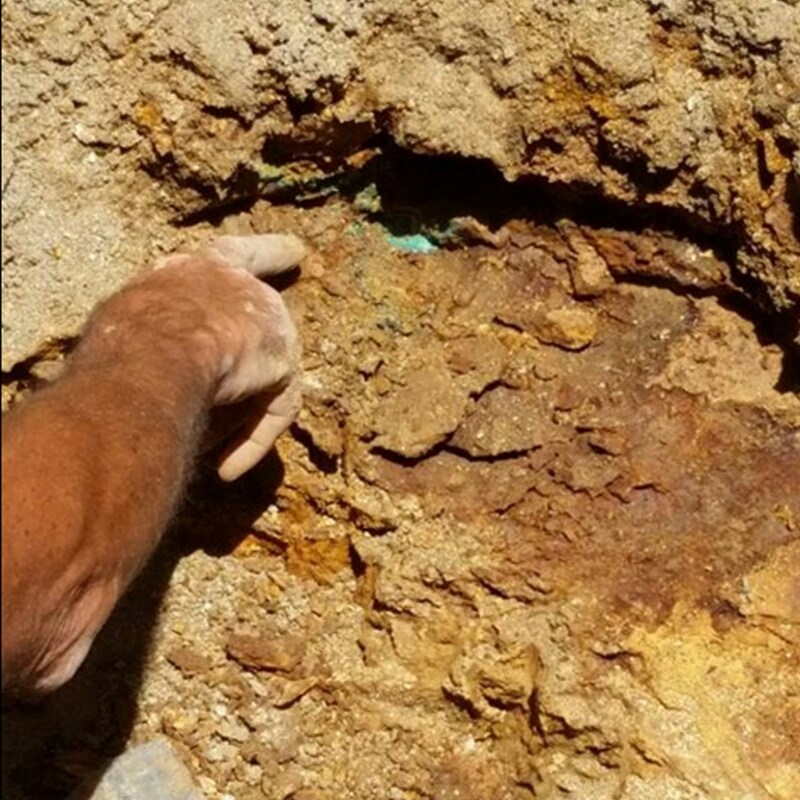 Our natural untreated turquoise is mined by hand (not using any heavy machinery) at the oldest mine in Colorado, USA. 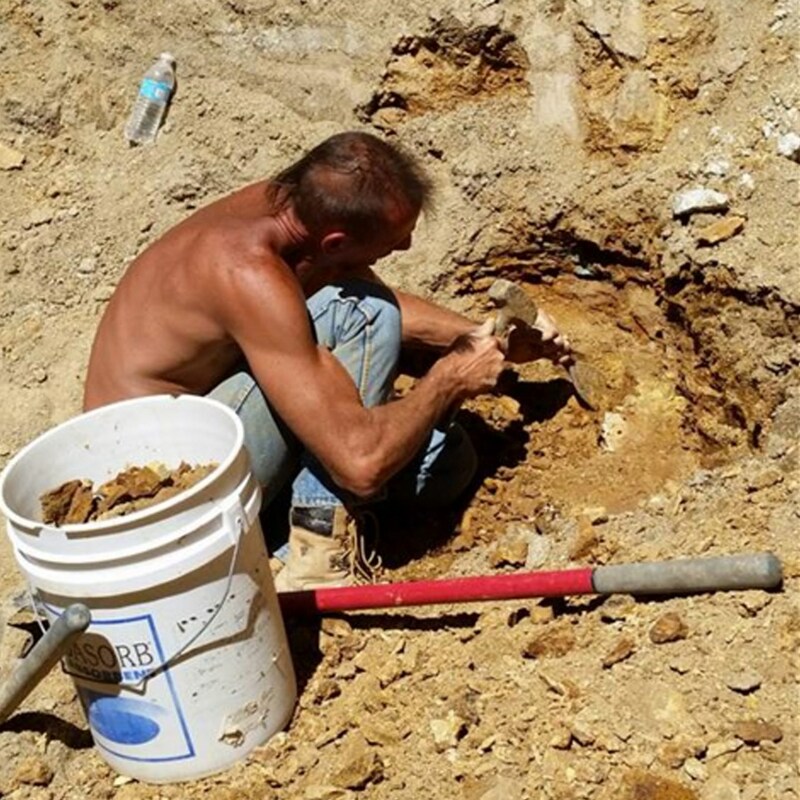 Mining using only hand tools has meant that only a very minimal amount of earth (less than half an acre) has been disturbed despite being mined for over 75 years. 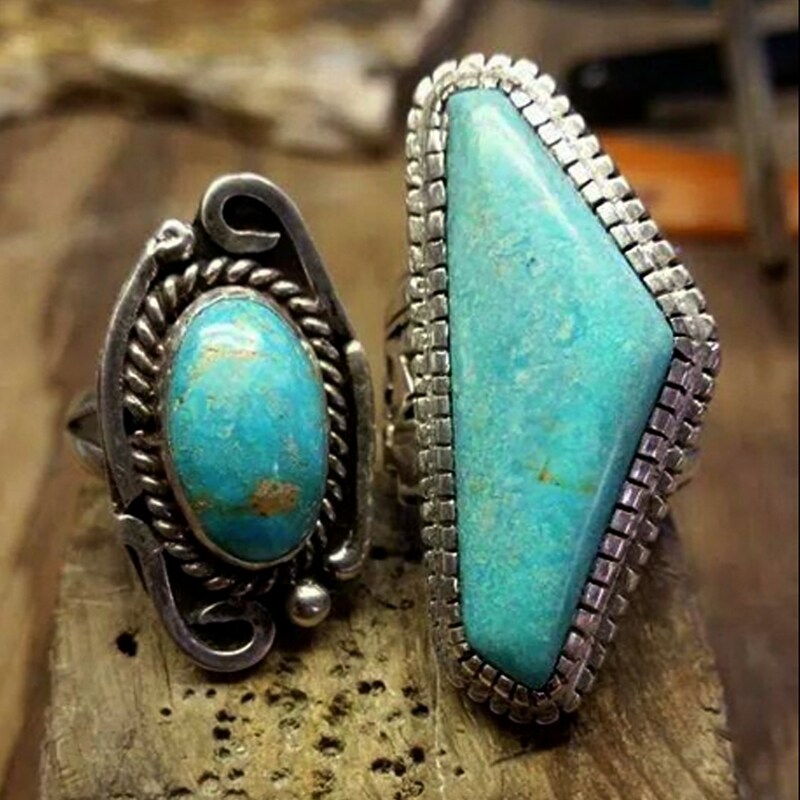 This makes this American turquoise an ethical choice for those concerned with environmental issues. 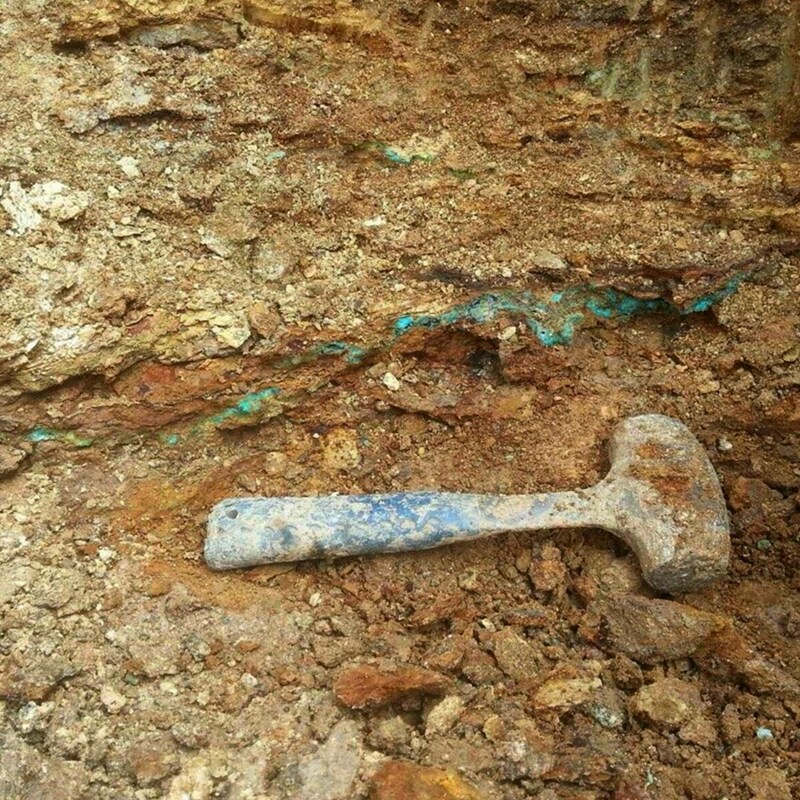 In this and the following photo you can see the vein of turquoise revealed in the earth. 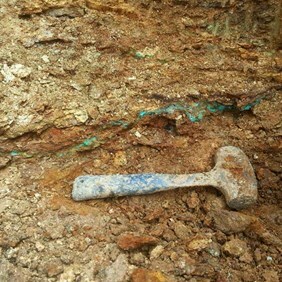 A vein of natural turquoise revealed by the miner. 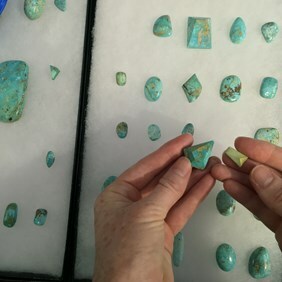 After a lot of experimenting with different polishing grits, the miner discovered that the best thing to polish the turquoise with was itself, so the pieces of turquoise are tumbled with turquoise grit to get them to a semi polished state. No chemicals and no other polishing grits make this stone very gentle on the environment. Here the turquoise is being sorted. Some will be made into cabochons and beads, whilst some will be left as rough, free-form gems. The miner - Clint sorting through the turquoise. Clint is 3/4 Native American. His tribe is in Vermont and is called 'Sokoko Band of the Abenanki, Nation of the Missisquoi'. Turquoise is a strong part of the Native American history and it holds much value in many families. A close up of the beautifully vivid, rough and untreated turquoise. Natural turquoise cabochons on dop sticks part way through the polishing process. 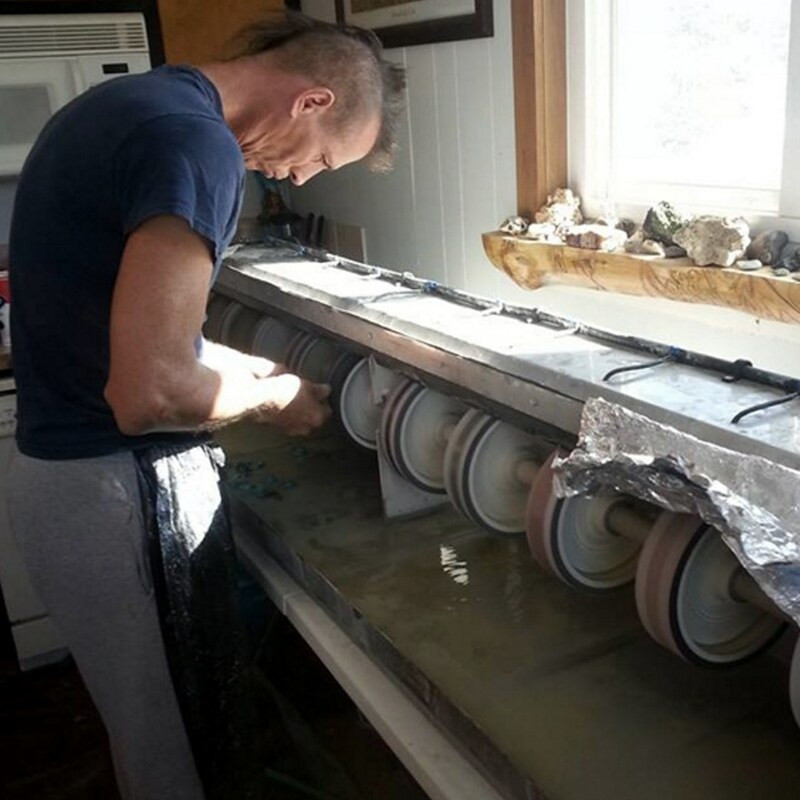 Polishing the turquoise cabochons in the workshop in Colorado, USA. 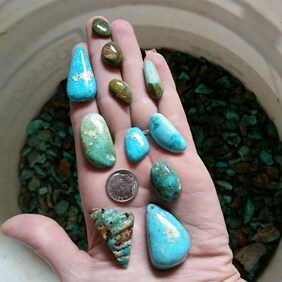 A selection of 100% natural American turquoise in freeform shape cabochons. 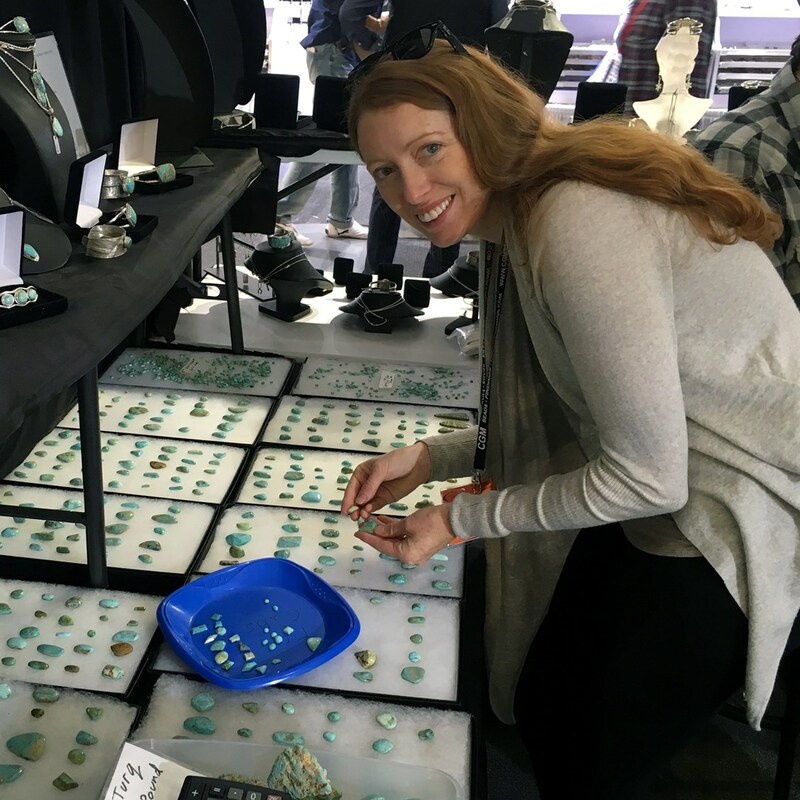 Kernowcraft's Managing Director on a recent buying trip where she was able to hand select a limited range of turquoise geometric and freeform cabochons as well as a regular supply of calibrated cabochons. 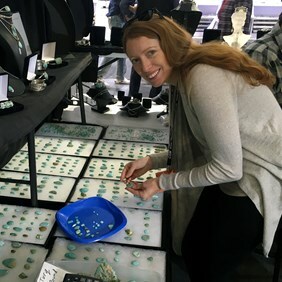 Hannah, Managing Director at Kernowcraft hand selecting a range of 100% natural turquoise. Some examples of the natural turquoise once set into jewellery. 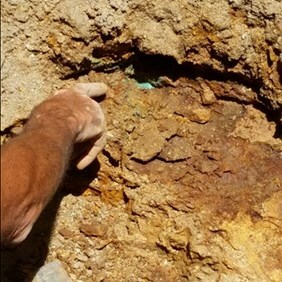 Holding a large vein of natural turquoise in its raw state, complete with small pieces of gold growing within the rock. 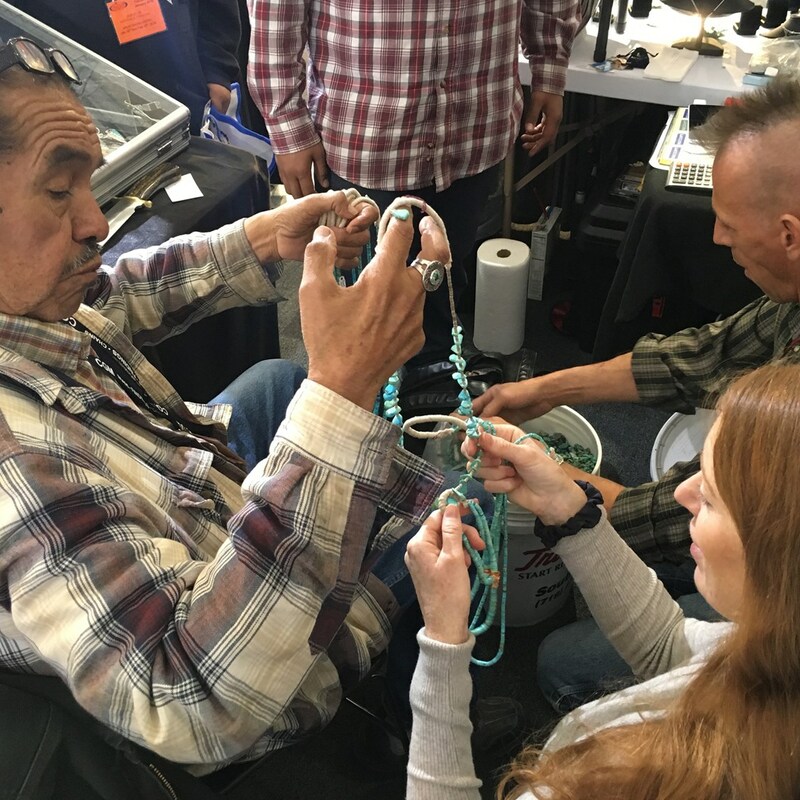 Our buying team were also lucky to meet Ray Lovato, author and turquoise bead cutter. 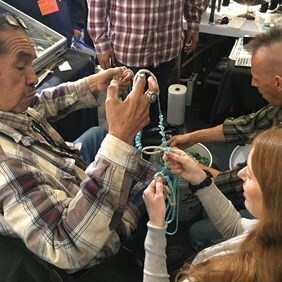 Ray cuts the most exquisite and highly sought after turquoise heishi beads and creates wonderful Native American jewellery, turquoise is an important part of his culture and he has built a knowledgeable reputation for the best cut beads. The following tips are good advice to take when starting to buy gemstones and looking for a reputable supplier who you can trust. Look for a long standing gemstone specialist supplier with a good reputation across the jewellery making industry. At Kernowcraft Rocks & Gems we have been selling gemstones since 1967 and have built up an excellent reputation. If you are shopping for gems elsewhere do make sure that they are reputable and genuine specialists within the gemstone industry. Many suppliers do not disclose all gemstone treatments, which is not necessarily a problem as many stones have treatments and this is regarded as industry standard. However, you should be able to ask suppliers for specific details and receive a knowledgeable reply if you ask for more details. Be careful of gemstones specifically advertised as totally natural - to a knowledgeable eye many of these have been clearly treated or dyed. Either ask for advice from someone with good experience with gemstones, or contact the supplier directly. 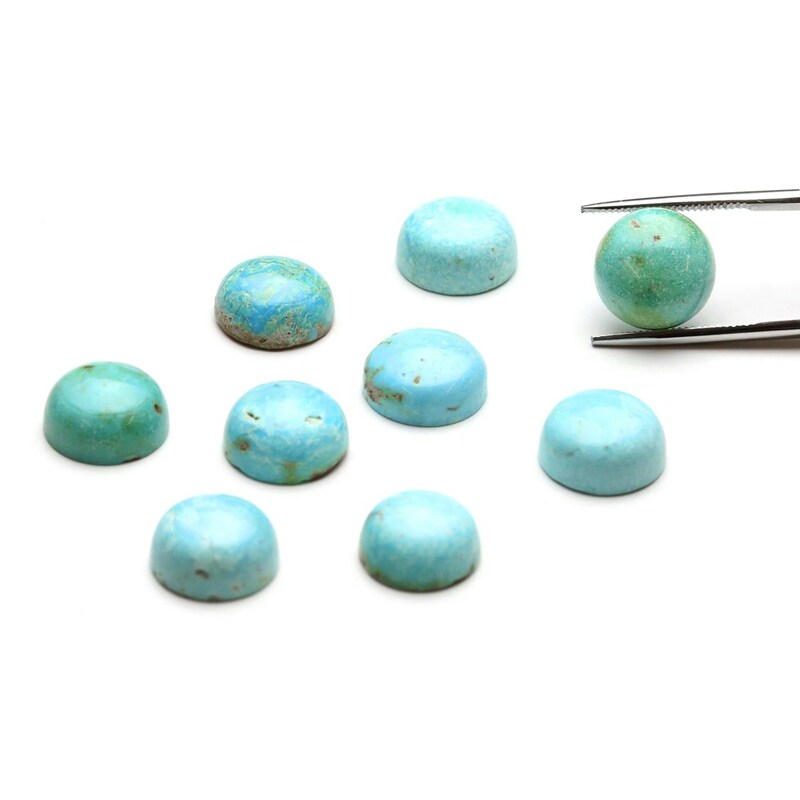 Natural turquoise often has small pits which can be seen, in stabilised or reconstituted turquoise you will not be able to see these as the resin will have filled the natural pits. Whilst you probably don't want to damage your stone, a resin stabilised stone when burnt will smell similar to plastic. When our supplier showed us this with his totally natural stones, whilst the stone still went black and sooty under the flame it wiped off immediately and left no damage to the stone. Veins of matrix or spider webbing are good indications of a natural stone (although it is still very likely that it has been stabilised). Manufacturers are becoming good at faking the natural veins in turquoise so look closely and don't always assume this means it is completely natural. 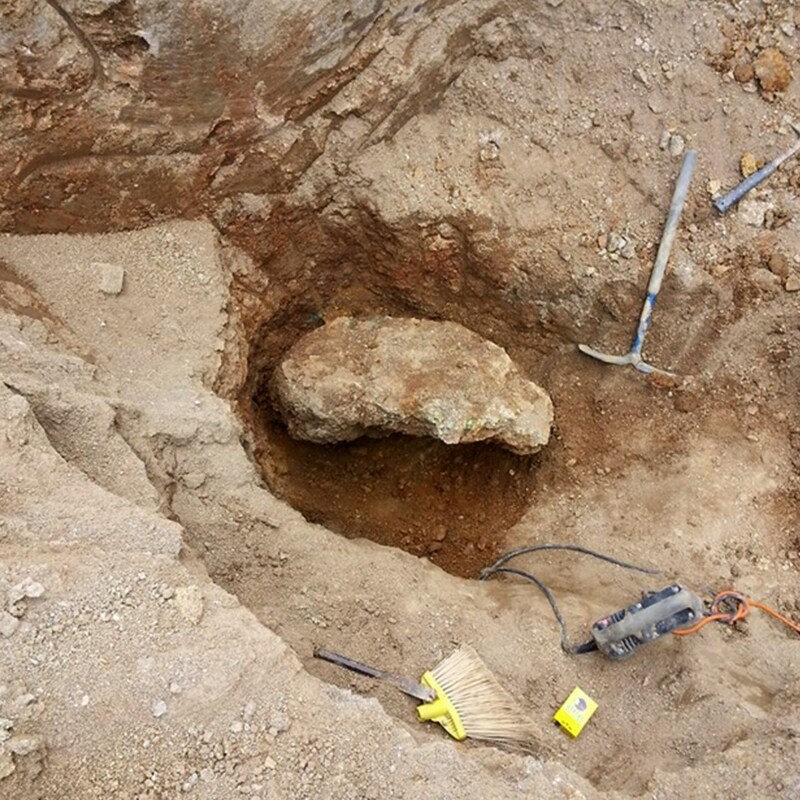 Is the miner and original supplier registered with a recognised gemstone association? The couple who mine and cut our natural, untreated turquoise are members of the American Gemstone Trade Association who are very stringent on openness of treatments and high standards within the gem industry. Has the turquoise been tested by an independent lab? Of course you can send a gemstones off to a laboratory and get it tested yourself but this is likely to be costly. 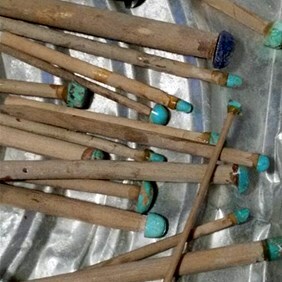 Our turquoise was tested by a well-known gemstone laboratory in America and was found to be as expected: that is with no treatments at all, no stabilisation and no colour treatments. Price. The price will be a very good indication of whether you are buying natural turquoise or not. Having read this far you will realise that hard natural turquoise stones are no longer the norm and good quality totally natural and untreated turquoise is actually very rare and valuable. 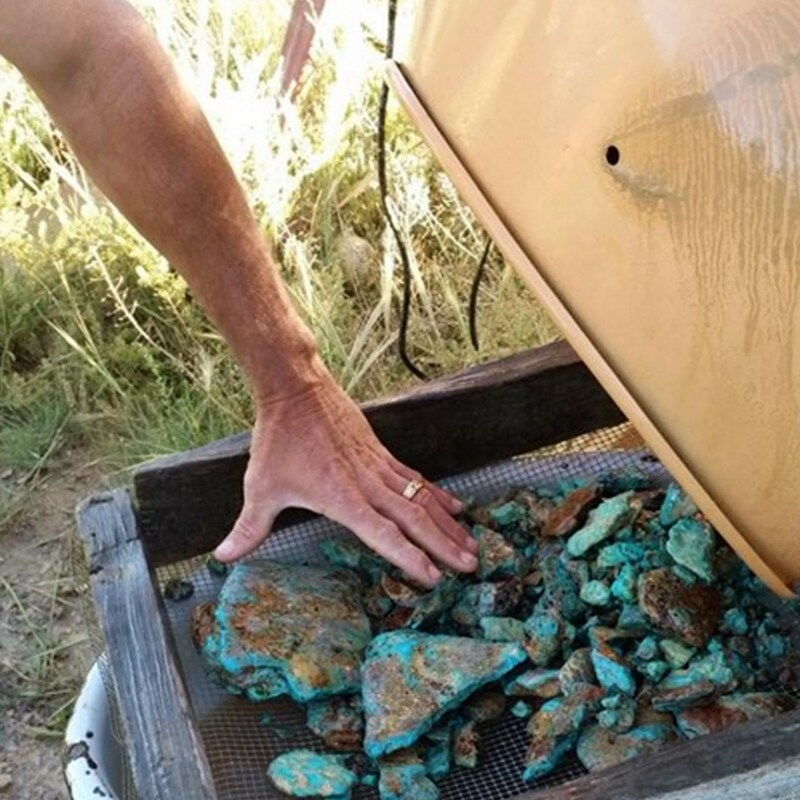 Therefore natural untreated turquoise doesn't come cheap. If you see a supplier selling a strand of beads for just a few pounds it is not going to be genuine untreated natural turquoise. Click here to buy calibrated 100% natural untreated turquoise cabochons. Click here to see our full range of turquoise cabochons and beads in addition to our 100% natural untreated turquoise. At Kernowcraft we sell a wide variety of beautiful types of turquoise in various cuts.